You may truly believe that having a wide selection of homes to choose from is the only way to find one you love. Guess what? It’s a proven fact that having too many choices only increases your chance of making the wrong choice! Has that ever been you? Most likely you face an insane number of choices for all sorts of products, whether you’re at the grocery store, the shopping mall, or the car lot. Both the big and small purchases in your life! Spend time “researching” before you’re a serious buyer. Get educated about your local market in terms of price, location and features. Visit open houses, go online, and talk to friends about how they made their home-buying decision. This way your expectations are realistic and you’ll be more confident when you do become a serious buyer with an agent. Keep this time productive so you can move on to become a ready buyer or you’ll still be “looking” two years down the road. Compare apples to apples. 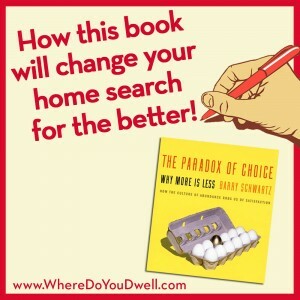 It’s not a good idea to compare houses that are in two very different locations – it will only lead to “analysis paralysis”! For example, a home in the suburbs is most likely going to be bigger and possibly newer than a similar priced home in the most desirable location in the city. To avoid this from happening, you first need to narrow you’re your location by deciding what lifestyle you want. However, if you decide to be open to other locations, compare similar homes within the specific location. Let us know if you have any questions about l choosing a home. 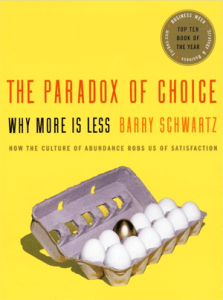 We definitely recommend reading “The Paradox of Choice” for further insight.